AU: S4 (Prescription only) for tablet and injection. Unscheduled for cream form under 10 g.
UK: POM (Prescription only) for tablet and injection. GSL (OTC) for cream form under 2 g.
Common side effects include nausea and diarrhea. Potentially serious side effects include kidney problems and low platelets. Greater care is recommended in those with poor liver or kidney function. It is generally considered safe for use in pregnancy with no harm having been observed. It appears to be safe during breastfeeding. 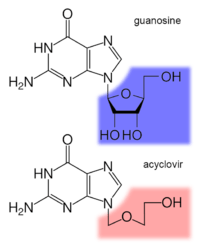 Aciclovir is a nucleic acid analogue made from guanosine. It works by decreasing the production of the virus's DNA. Its effectiveness in treating Epstein-Barr virus (EBV) infections is less clear. It has not been found to be useful for infectious mononucleosis due to EBV. Aciclovir by mouth, however, does not appear to decrease the risk of pain after shingles. In those with herpes of the eye, aciclovir was found to be more effective than idoxuridine or vidarabine in relative number of successfully healed eyes. Intravenous aciclovir is effective to treat severe medical conditions caused by different species of the herpes virus family, including severe localized infections of herpes virus, severe genital herpes, chickenpox and herpetic encephalitis. It is also effective in systemic or traumatic herpes infections, eczema herpeticum and Herpes simplex meningitis. Reviews of research dating from the 1980s show there is some effect in reducing the number and duration of lesions if aciclovir is applied at an early stage of an outbreak. Recent research shows effectiveness of topical Aciclovir in both the early and late stages of the outbreak as well as improving methodologically and in terms of statistical certainty from previous studies. Aciclovir trials show that this agent has no role in preventing HIV transmission, but it can help slow HIV disease progression in people not taking anti-retroviral therapy (ART). This finding emphasizes the importance of testing simple, inexpensive non-ART strategies, such as aciclovir and cotrimoxazole, in people with HIV. Ketoconazole: In-vitro replication studies have found a synergistic, dose-dependent antiviral activity against HSV-1 and HSV-2 when given with aciclovir. However, this effect has not been clinically established and more studies need to be done to evaluate the true potential of this synergy. Interferon: Synergistic effects when administered with aciclovir and caution should be taken when administering aciclovir to patients receiving IV interferon. Resistance to aciclovir is rare in people with healthy immune systems, but is more common (up to 10%) in people with immunodeficiencies on chronic antiviral prophylaxis (transplant recipients, people with acquired immunodeficiency syndrome due to HIV infection). Mechanisms of resistance in HSV include deficient viral thymidine kinase; and mutations to viral thymidine kinase or DNA polymerase, altering substrate sensitivity. Varicella zoster virus-produced plaques in monolayers of MRC5 cells. When the virus was reproducing each well contained different amounts of the antiviral drug aciclovir. By counting the plaques (holes formed by the virus in the layer of cells) the potency of the aciclovir to the virus was calculated. Acyclovir is poorly water-soluble and has poor oral bioavailability (15–30%), hence intravenous administration is necessary if high concentrations are required. When orally administered, peak plasma concentration occurs after 1–2 hours. Aciclovir has a high distribution rate; protein binding is reported to range from 9 to 33%. The elimination half-life (t1/2) of aciclovir depends according to age group; neonates have a t1/2 of 4 hours, children 1–12 years have a t1/2 of 2–3 hours whereas adults have a t1/2 of 3 hours. Aciclovir is the INN and BAN while acyclovir is the USAN and former BAN. It was originally marketed as Zovirax; patents expired in the 1990s and since then it is generic and is marketed under many brand names worldwide. The wholesale cost for a 400 mg tablet in March 2016 was between US$0.03 and US$0.12 per dose. 1 2 3 "Aciclovir". Drugs.com. Retrieved 6 September 2015. 1 2 3 4 "Zovirax (acyclovir) dosing, indications, interactions, adverse effects, and more". Medscape Reference. WebMD. Retrieved 5 February 2014. 1 2 de Clercq, Erik; Field, Hugh J (5 October 2005). "Antiviral prodrugs – the development of successful prodrug strategies for antiviral chemotherapy". British Journal of Pharmacology. 147 (1). Wiley-Blackwell (published January 2006). pp. 1–11. doi:10.1038/sj.bjp.0706446. PMC 1615839 . PMID 16284630. 1 2 3 4 5 6 "Acyclovir". The American Society of Health-System Pharmacists. Retrieved Jan 1, 2015. ↑ Rafailidis PI, Mavros MN, Kapaskelis A, Falagas ME (2010). "Antiviral treatment for severe EBV infections in apparently immunocompetent patients". Journal of Clinical Virology : the Official Publication of the Pan American Society for Clinical Virology. 49 (3): 151–7. doi:10.1016/j.jcv.2010.07.008. PMID 20739216. 1 2 Hamilton, Richart (2015). Tarascon Pocket Pharmacopoeia 2015 Deluxe Lab-Coat Edition. Jones & Bartlett Learning. p. 59. ISBN 9781284057560. ↑ Clercq, edited by Erik De (2013). Anti-viral agents (1 ed.). San Diego, CA: Academic Press. p. 5. ISBN 9780124055377. 1 2 "Aciclovir". International Drug Price Indicator Guide. Retrieved 6 September 2015. 1 2 "Pharmacy Pricing". Medicaid. March 2016. Retrieved 8 March 2016. ↑ Joint Formulary Committee (2013). British National Formulary (BNF) (65 ed.). London: Pharmaceutical Press. ISBN 978-0-85711-084-8. ↑ Elad S, Zadik Y, Hewson I, et al. (August 2010). "A systematic review of viral infections associated with oral involvement in cancer patients: a spotlight on Herpesviridea". Support Care Cancer. 18 (8): 993–1006. doi:10.1007/s00520-010-0900-3. PMID 20544224. ↑ Gershburg, E; Pagano, JS (August 2005). "Epstein-Barr virus infections: prospects for treatment.". The Journal of antimicrobial chemotherapy. 56 (2): 277–81. PMID 16006448. ↑ Chen, N; Li, Q; Yang, J; Zhou, M; Zhou, D; He, L (Feb 6, 2014). "Antiviral treatment for preventing postherpetic neuralgia.". The Cochrane database of systematic reviews. 2: CD006866. doi:10.1002/14651858.CD006866.pub3. PMID 24500927. ↑ Wilhelmus KR (2010). "Antiviral treatment and other therapeutic interventions for herpes simplex virus epithelial keratitis". Cochrane Database Syst Rev. 12: CD002898. doi:10.1002/14651858.CD002898.pub4. PMC 4739528 . PMID 21154352. ↑ Spruance SL, Nett R, Marbury T, Wolff R, Johnson J, Spaulding T (2002). "Acyclovir cream for treatment of herpes simplex labialis: results of two randomized, double-blind, vehicle-controlled, multicenter clinical trials". Antimicrob. Agents Chemother. 46 (7): 2238–43. doi:10.1128/aac.46.7.2238-2243.2002. PMC 127288 . PMID 12069980. ↑ Mascolinli, M; Kort, R (June 2010). "5th International AIDS Society Conference on HIV Pathogenesis, Treatment and Prevention: summary of key research and implications for policy and practice - biomedical prevention" (PDF). Journal of the International AIDS Society. 13 Suppl 1 (Suppl 1): S4. doi:10.1186/1758-2652-13-S1-S4. PMC 2880255 . PMID 20519025. ↑ "Drugs for non-HIV viral infections". Treatment guidelines from the Medical Letter. 3 (32): 23–32. 2005. PMID 15767977. 1 2 3 4 "PRODUCT INFORMATION NAME OF THE DRUG OZVIR TABLETS" (PDF). TGA eBusiness Services. Ranbaxy Australia Pty Ltd. 26 August 2011. Retrieved 6 February 2014. ↑ Razonable, RR (October 2011). "Antiviral drugs for viruses other than human immunodeficiency virus" (PDF). Mayo Clinic proceedings. Mayo Clinic. 86 (10): 1009–26. doi:10.4065/mcp.2011.0309. PMC 3184032 . PMID 21964179. ↑ Brigden D, Rosling AE, Woods NC (July 1982). "Renal function after acyclovir intravenous injection". The American Journal of Medicine. 73 (1A): 182–5. doi:10.1016/0002-9343(82)90087-0. PMID 6285711. ↑ Sawyer MH, Webb DE, Balow JE, Straus SE (June 1988). "Acyclovir-induced renal failure. Clinical course and histology". The American Journal of Medicine. 84 (6): 1067–71. doi:10.1016/0002-9343(88)90313-0. PMID 3376977. ↑ Pottage Jr, J. C.; Kessler, H. A.; Goodrich, J. M.; Chase, R; Benson, C. A.; Kapell, K; Levin, S (1986). "In vitro activity of ketoconazole against herpes simplex virus". Antimicrobial Agents and Chemotherapy. 30 (2): 215–9. doi:10.1128/aac.30.2.215. PMC 180521 . PMID 3021048. ↑ Bach, M. C. (1987). "Possible drug interaction during therapy with azidothymidine and acyclovir for AIDS". New England Journal of Medicine. 316 (9): 547–548. doi:10.1056/NEJM198702263160912. PMID 3468354. ↑ Baselt, RC (2008). Disposition of toxic drugs and chemicals in man (8th ed.). Foster City, CA: Biomedical Publications. pp. 29–31. ISBN 9780962652370. ↑ "Acyclovir (acyclovir) Capsule Acyclovir (acyclovir) Tablet [Genpharm Inc.]". DailyMed. Genpharm Inc. November 2006. Retrieved 5 February 2014. ↑ "Aciclovir Tablets BP 400mg - Summary of Product Characteristics (SPC)". electronic Medicines Compendium. Actavis UK Ltd. 20 August 2012. Retrieved 5 February 2014. ↑ Sweetman, S, ed. (7 August 2013). "Aciclovir". Martindale: The Complete Drug Reference. London, UK: Pharmaceutical Press. Retrieved 6 February 2014. ↑ Piret J, Boivin G (2011). "Resistance of herpes simplex viruses to nucleoside analogues: mechanisms, prevalence, and management". Antimicrob. Agents Chemother. 55 (2): 459–72. doi:10.1128/AAC.00615-10. PMC 3028810 . PMID 21078929. ↑ O'Brien, JJ; Campoli-Richards, DM (1989). "Acyclovir. An updated review of its antiviral activity, pharmacokinetic properties and therapeutic efficacy". Drugs. 37 (3): 233–309. doi:10.2165/00003495-198937030-00002. PMID 2653790. ↑ Wagstaff, AJ; Faulds, D; Goa, KL (January 1994). "Aciclovir. A reappraisal of its antiviral activity, pharmacokinetic properties and therapeutic efficacy.". Drugs. 47 (1): 153–205. doi:10.2165/00003495-199447010-00009. PMID 7510619. ↑ Garrison, Tom (1999). Oceanography: An Invitation to Marine Science, 3rd ed. Belmont, CA: Wadsworth Publishing Company. p. 471. ↑ Sepčić, K. (2000). "Bioactive Alkylpyridinium Compounds from Marine Sponges". Toxin Reviews. 19 (2): 139–160. doi:10.1081/TXR-100100318. ↑ Laport, M. S.; Santos, O. C.; Muricy, G (2009). "Marine sponges: Potential sources of new antimicrobial drugs". Current pharmaceutical biotechnology. 10 (1): 86–105. doi:10.2174/138920109787048625. PMID 19149592. ↑ Schaffer, Howard; Robert Vince; S. Bittner; S. Gurwara (1971). "Novel substrate of adenosine deaminase". Journal of Medicinal Chemistry. 14 (4): 367–369. doi:10.1021/jm00286a024. PMID 5553754. ↑ Elion, Gertrude; Furman PA; Fyfe, James A.; De Miranda, Paulo; Beauchamp, Lilia; Schaeffer, Howard J. (1977). "Selectivity of action of an antiherpetic agent, 9-(2-hydroxyethoxymethyl)guanine". Proc Natl Acad Sci USA. 74 (12): 5716–5720. Bibcode:1977PNAS...74.5716E. doi:10.1073/pnas.74.12.5716. PMC 431864 . PMID 202961. ↑ Vince R (2008). "A brief history of the development of Ziagen". Chemtracts. 21: 127–134. Hazra, S; Konrad, M; Lavie, A (2010). "The sugar ring of the nucleoside is required for productive substrate positioning in the active site of human deoxycytidine kinase (dCK): Implications for the development of dCK-activated acyclic guanine analogues". Journal of Medicinal Chemistry. 53 (15): 5792–800. doi:10.1021/jm1005379. PMC 2936711 . PMID 20684612. Périgaud C.; Gosselin G.; Imbach J.-L. (1992). "Nucleoside analogues as chemotherapeutic agents: a review". Nucleosides and nucleotides. 11 (2–4).